VANCOUVER, B.C., Canada, Jan. 26 (SEND2PRESS NEWSWIRE) — Extending its solutions from its proven Windows OS data recovery experience and expertise, MiniTool Solution Ltd announces another free data recovery application – MiniTool Mac Data Recovery 2.0. Designed for Mac OS and once again FREE for home users to restore Mac OS data up to 1GB. MiniTool Mac Data Recovery is an all-in-one file recovery software application for home and business users. It can recover deleted files and folders, restore lost data – even if the partition is formatted or deleted – and restore data from a corrupted hard drive, virus infection, and other unexpected system shutdown or software failure. It supports IDE, SATA, SCSI, USB hard disk, memory card, USB flash drive and iPod®. MiniTool Mac Data Recovery includes four data recovery modules: Undelete Recovery, Damaged Partition Recovery, Lost Partition Recovery and Digital Media Recovery. Each data recovery module focuses on different data loss cases. 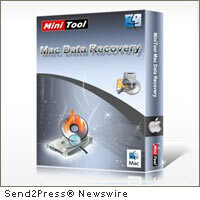 With MiniTool Mac Data recovery 2.0 Free Edition, the user can restore lost data up to 1GB in size. Hard Disk/Device: 1GB and above. File System Supported: HFS+, FAT16/32, NTFS. A MiniTool Mac Data Recovery Boot CD is also available. With our Mac Data Recovery Boot CD, a user can boot a Mac computer directly to recover data after system crash, hard drive crash or have a boot problem. For complete product information, visit http://mac.powerdatarecovery.com/products.html . Download Free MiniTool Mac Data Recovery at http://mac.powerdatarecovery.com/download.html today and start to scan and restore your valuable information. If you would like more information about this topic, or to schedule an interview with MiniTool Mac Data Recovery, please contact the company by email at: support@minitool.com . Original Keywords: MiniTool Solution Ltd, MiniTool Mac Data Recovery 2, freeware, Designed for Mac OS X, Mac OSX, software, utility, recover, repair, save, first aid, mini tool, tools, Macintosh, Canada business news, Vancouver British Columbia MiniTool Solution Ltd Vancouver British Columbia, Canada VANCOUVER, B.C. REFERENCES: Apple Mac and iOS News, MiniTool Solution Ltd, MiniTool Mac Data Recovery 2, freeware, Designed for Mac OS X, Mac OSX, software, utility, recover, repair, save, first aid, mini tool, tools, Macintosh, Canada business news, Vancouver British Columbia MiniTool Solution Ltd Vancouver British Columbia, Canada VANCOUVER, B.C.